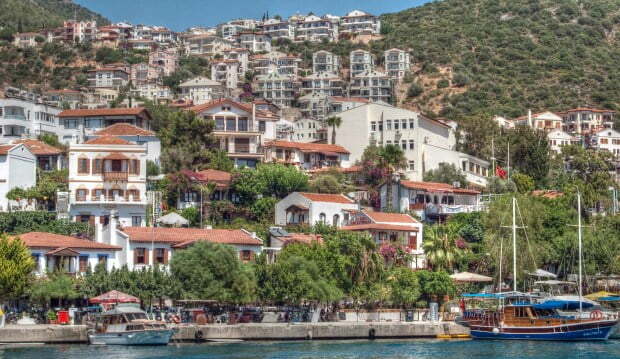 Kas is everything that a typical Mediterranean seaside resort in Turkey should be. White washed houses cascade down the winding mountain roads to show the way to beautiful beaches and a harbor that reminds you that life is in fact quite good and while in Kas, the best thing to do is to adapt quickly to the Mediterranean lifestyle. Many of the houses in Kas are surrounded with pink bougainvillea flowers that immediately make you notice the influence of Greek architecture in some of the older properties, typically the wooden shutters, narrow streets and large terraces for enjoying the mid-day sun. Like many towns in this area, there used to be a huge Greek population until 1923 when there was an exchange of citizens between Greece and Turkey. That was a turbulent time for the area, when people were unsure of the future. I think they would be proud now, to know that Kas is making a name for itself as a “must visit” Mediterranean destination in Turkey. The town was the third stop on my South Western tour and on my first day, I did feel weary of losing my way. However once I found a map and discovered it is actually impossible to get lost in the tiny coastal resort; I started to ease up and did not have to be persuaded twice to sit on a terrace watching the sunset while drinking an ice cold beer. Having before, found myself lost in the resorts of Kemer and Cirali, I quickly established that in Kas, if I did find myself in unknown areas, all I had to do was head down to the hill and towards the sea. 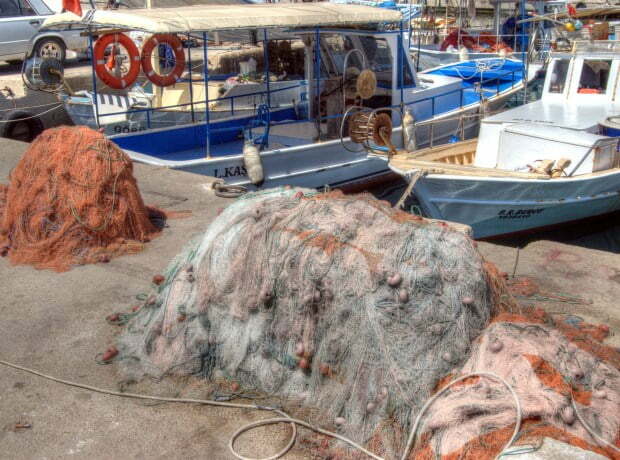 A walk along the harbor of Kas while the fishing boats dock in and unload their catch will fill the air with the smell of fresh fish and naturally, the restaurants surrounding the harbor take advantage of this. Lobster, crab and all types of fish are on the menu. That is what makes Kas so great if you are a fish or seafood lover; all the restaurants produce excellent dishes and will be probably be one of the best fish dishes you ever taste. 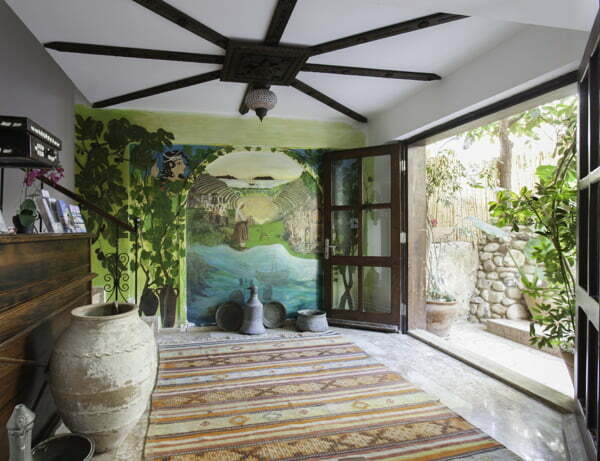 While Kas is a laid back Mediterranean resort, it is also important to know that it is at the forefront of a trend that has started to become popular in recent years. I had the great opportunity to spend a week with Bougainville Travel who was the first company in the town to establish adventure activities for people of all ages. Their activities range from trekking along the Lycian way to sea kayaking to giving your adrenaline glands a work-out by paragliding. Parents who are worried about keeping their kids from being bored can fill their days with canyoning, mountain bike riding or scuba diving in the clear seas surrounding Kas. Along with spending time with the staff of Bougainville travel, one of the great things I also loved about Kas and I decided to extend my stay because of it, is the local bus transport. Frequently buses will leave for the surroundings towns and historical sites making exploring so easy and practicable. 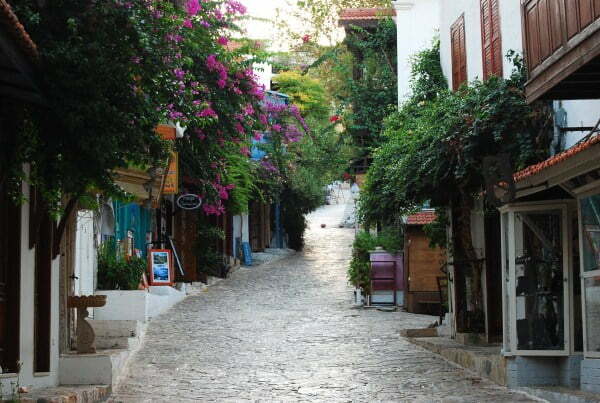 Catch a bus to the surrounding resorts of Olympos or Kalkan. Head a little bit further to explore the church of St Nicholas and the ruins of Myra in Demre. 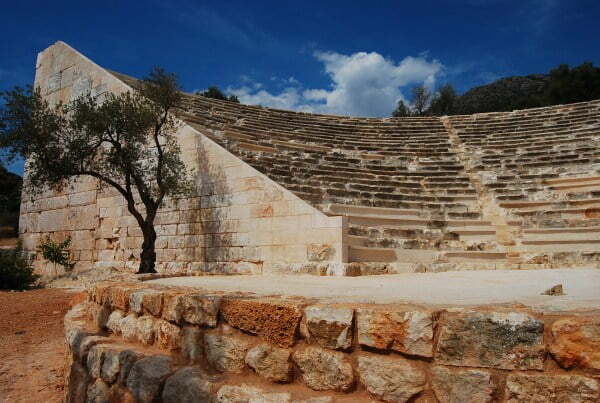 Lycian tombs and the small ampitheatre within Kas will also attract the attention of history lovers. Basically, the town will suit many. The only people who may be disappointed are those who want the large nightclubs that are open till five in the morning. In that case, they should head to the resorts of Bodrum, Kemer, Antalya or Marmaris instead. 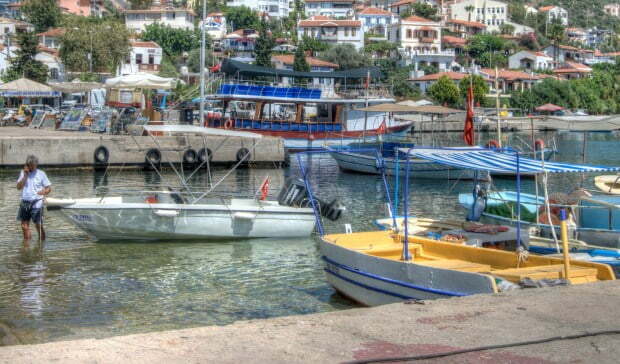 Kas is a well-kept town and upon first appearance, you may think that it is not suitable for budget travelers. Some of the restaurants can be pricy along with the accommodation but just look that little bit further to discover cheap Turkish pansions and Lokantas that make Kas an ideal destination for those traveling on a budget. Situated on one of the small side streets, the Hideaway Hotel is close to the harbour and seafront but also just 7 minutes walk from the main bus station and old town which is the focal point for tourism, restaurants and shops. The family-run business has established an excellent reputation on Trip Advisor because of all their high reviews. They have also been recommended by Lonely Planet. As well as the obligatory rooftop terrace with stunning views, other amenities include a swimming pool, free Internet access, yoga sessions every morning and an on-site restaurant and bar. 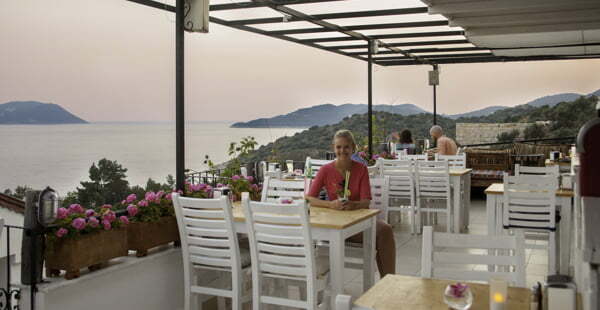 Check out their website which has more photos, rates and further details of how they can help you with a holiday in Kas. You can fly into Antalya airport which is a three hour transfer or Dalaman airport of which the transfer is two hours. 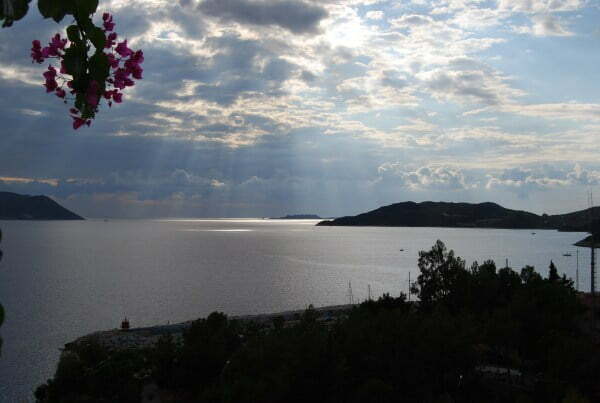 If you are driving, Kas it is located just off the Antalya highway that runs parallel with the coast. Public transport to the town is frequent, cheap and it can be accessed from all the surrounding resorts of Kalkan, Fethiye, Cirali and Antalya. (Update from a return visit) Sometimes I feel that I am extremely blessed. I originally wrote this post while on a tour two years ago, but just last month, went back to Kas while on a four-day Blue Cruise of the Mediterranean coast. It was a delight to explore the streets that I had fond memories of. 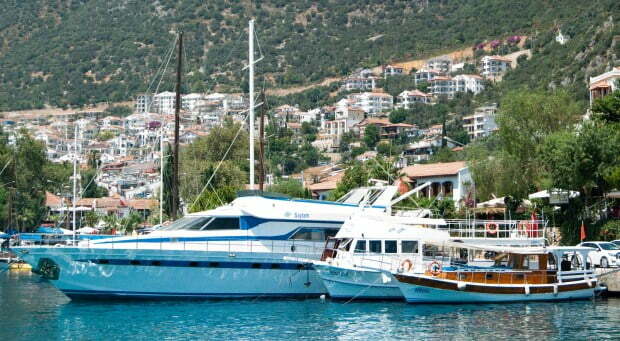 It also struck me, that out of all the holiday resorts in Turkey, I received the least amount of hassle in Kas. Often holiday-makers complain that they get hassle by shop owners, bars and restaurants, who want their trade. As I re-traced my footsteps from two years ago, I wandered into a souvenir shop and browsed through at my leisure with no hassle or pressure from the saleman. It was wonderful to experience hassle-free shopping. My stay was brief, since my overnight accommodation was the gulet boat, that we were staying on. However the rest of my time, was spent down at the harbour. Watching the fishermen, laughing at ducks, observing the scuba diving crews prepping up their gear and basically admiring the original view that so impressed me; the white washed houses promoting that typical Mediterranean coast feel. 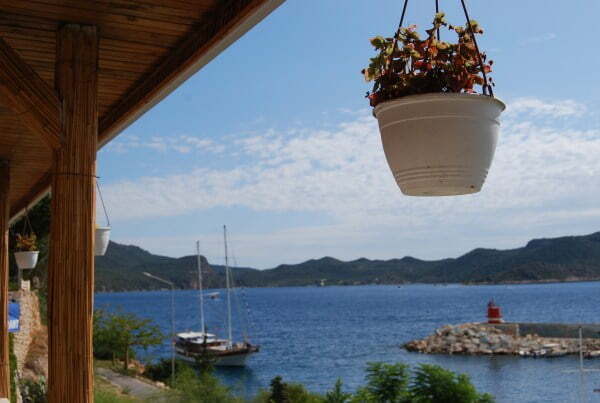 I thought for a while and answered “Kas” It really is one of the best resorts in Turkey. I am still here Natalie – life is carrying on as normal. Yes, there are safety concerns but every country in the world has the same problem. 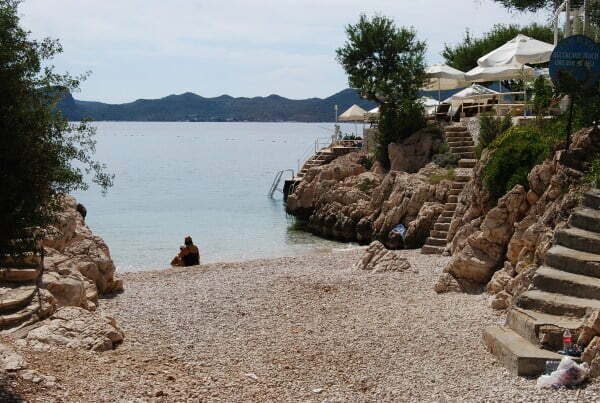 I would go to Kas. It is a nice place. Hi, I am travelling (planning) to Kas on november, however I am a little concern about the actual situation of turkey and siria, could you tell me if it’s a safe place to spend some time over there? What do you think about the actual situation of Turkey? This is our fifth year in a row returning to Kas. We travel here from NYC and I only wish we could come more often. We used to go to various Greek islands, but then they became too pricey for what we wanted. I discovered Kas through surfing and I’m so glad I did. We love it here! We stay on the Peninsula in a lovely small villa facing Kastellorizo and it’s true that there’s something here for everyone. As I write my twenty something daughter and her boyfriend are off sea kayaking and I’m blissfully not. A day of shopping in the village for me and then a swim in the sea which is right down the cliff from our villa. Not expensive but certainly a journey for us to get here from New York. So worth it! And the food! Natalie, I couldn’t agree with you more regarding Kas being the best place in Turkey. We fell completely in love with it on our first visit three years ago, and try to return at least once every year, if not more often. It’s wonderfully laid back, serene, charming and our little slice of paradise. Although geared for tourism, it still has plenty authentic local Turkish culture, which makes it better than Kalkan in my view. I only spent half a day in Turkey (Ephesus), but it’s a place I wish I had the opportunity to explore further. Nice pictures and story here–they took me away for a moment. Yes, we already knew that thanks Norma. For the pronunciation, I have had three Turks check it and they say it is fine to write it that way. Actually Judy is quite right, it is not pronounced “Cash” – the a is more rounded and held longer more like caash. Theodora – Just looked at Scandinavia on the map – i don’t think my fail proof method would work there! I love seaside navigation. Find sea. Establish relation to sea. All good. Gets terribly confusing in Scandinavia, though. Hi Liv, I was with Bougainville travel to interview their instructor and pilot called Veske. He took me up to the top of the mountain and did offer, unfortunately though I preferred to be behind the camera. I could not pluck up the courage to do it. I love Ucagiz and Kekova as well. Went there on the sea Kayaking trip. I can understand your friends moving to Kas. Olu is nice but Kas definitely has a place in my heart now. Hi Natalie – Did you go paragliding? 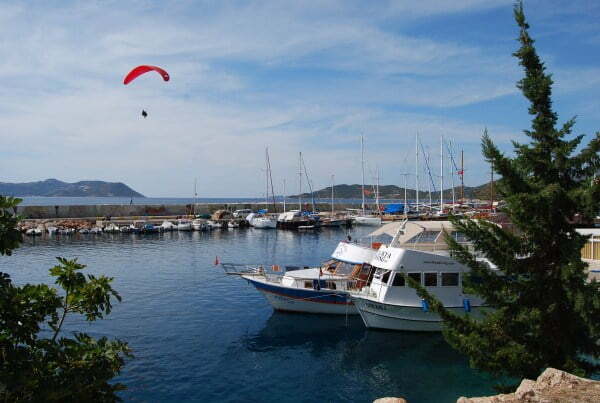 A few of my pilot friends ended up working in Kas after years in Oludeniz. I have always loved visiting Kas. It’s so pretty. Glad you enjoyed it. Did you get to Ucagiz and Kekova while you were there too? Beautiful places, gorgeous! Thanks Claudia. 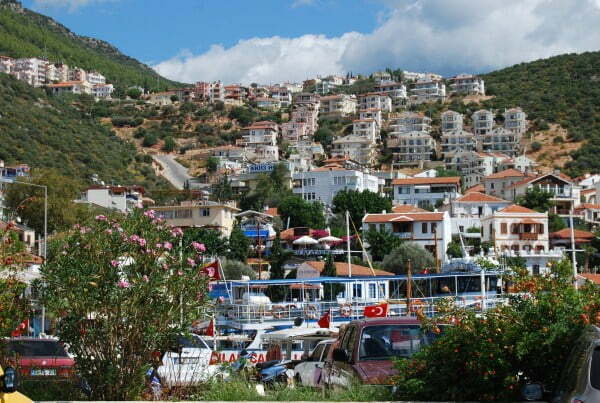 Kas is a good starting place if you want a nice introduction to Turkey. Have not been to Turkey. Kas definitely looks like a great place to visit. Love the photos. @Jack – I too, fell in love with it Jack. So adorable. @Julia. I too, tried putting in the Turkish spelling of Kas and WordPress would not accept it. That is why I put the pronouncation in at the beginning of the post. Stories of the adventure activities to come later! @Hobbit – Thank you for showing me the ropes. Made a difference to my trip. @Jeff – Another fan of Kas, we can all spread the word together. Loved Kas. We found a decent hostel that wasn’t too expensive there. The name now escapes me. Great place to stop off on the coastal route. Awww, we love Ka?, Natalie. Glad you enjoyed your time there and extended your stay. Did you get up to any of the adventure sports you mentioned in your post? with your back to the hills and facing the harbour, there is a little restaurant on the right and about the last building. They have some wonderful ruins inside that you can view through the glass floor. Kas is just wonderful. It’s my favourite resort and the venue for our honeymoon. i’ve been four times and will be return. I say again, I really envy you tour.